March 2016 Issue, Scouting Magazine! March 2016 Issue, Boy Scout Edition, Boys' Life! for our Wilderness and Remote First Aid program. Please contact us for facility requirements. Note: Please only use the email links on our web page to contact us! Many previously published email addresses are no longer valid. We are actively recruiting youth members for our now infamous crew! Venture age teenagers are welcome to join. 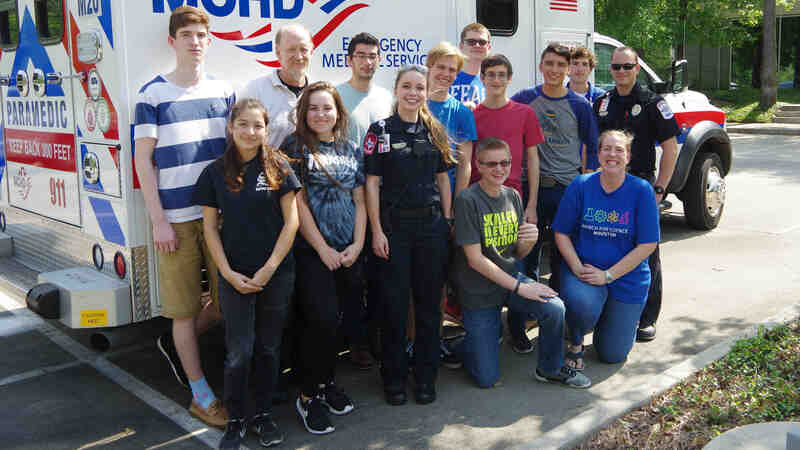 If you are interested in Advanced First aid, Lifeguarding, First Responder training or are considering a medical career, Crew-911 is for you. We offer training opportunities for Scouts and Scouters as well as an American Red Cross instructor program for Scouters and Scouts sixteen and older. Already a BSA Crew or Ship youth member? Join our "Green Shirted Friends" and participate in our activities too! We welcome youth members from all over the Sam Houston Area Council. Our Crew-911 meetings generally coincide with our scheduled training activities and we keep in touch electronically between our official events. Youth members from out of council are welcome too. Email us Join Crew-911 and our Crew-911 youth officers will answer your questions. The best way to check us out is to take a training course with us! Our Green Shirted Friends program offers older Scouts a fun Scouting opportunity but we expect our youth members to remain active in their Troop, Crew or Ship. Venture age Girl Scouts and American Heritage Girls youth members are welcome too. We will gladly answer adult leader or parents questions about our programs and our crew. Most of our youth members and our youth Green Shirted Friends associate with Crew-911 for our First Responder/Lifeguarding program. Crew-911 membership is intended to compliment but not replace youth participation in their Unit activities. Donations to your American Red Cross Chapter are always needed!